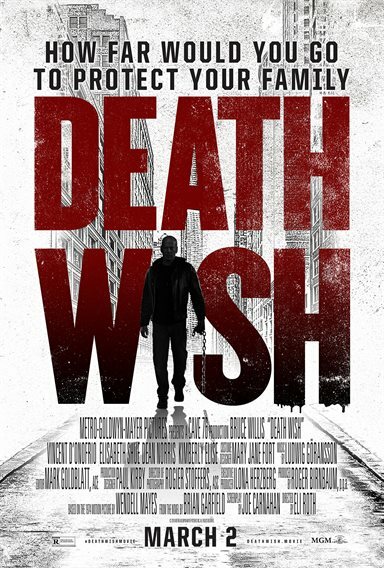 Metro-Goldwyn-Mayer Pictures presents director Eli Roth's reimagining of the classic 1974 revenge thriller Death Wish. Dr. Paul Kersey (Bruce Willis) is a surgeon who only sees the aftermath of Chicago violence when it is rushed into his ER - until his wife (Elisabeth Shue) and college-age daughter (Camila Morrone) are viciously attacked in their suburban home. With the police overloaded with crimes, Paul, burning for revenge, hunts his family's assailants to deliver justice. As the anonymous slayings of criminals grabs the media's attention, the city wonders if this deadlyvigilante is a guardian angel or a grim reaper. Fury and fate collide in the intense, action-thriller Death Wish. Updated from the original novel by Brian Garfield, director Eli Roth and screenwriter Joe Carnahan's (The Grey, Narc) Death Wish also stars Vincent D'Onofrio (The Magnificent Seven, TV's Daredeviland Law & Order: Criminal Intent), Elisabeth Shue (Leaving Las Vegas), Camila Morrone, Dean Norris (Breaking Bad) and Kimberly Elise (The Great Debaters). It's a knife's-edge portrayal that challenges our assumptions, and pushes our buttons. By bringing the complex psychology of Brian Garfield's book up-to-the-moment and injecting new thrills and a stark, unflinchinglook at the American psyche in 2017, Eli Roth and Death Wish brings audiences to the height of unforgettable suspense. Download Death Wish in Digital HD from the iTunes store. Death Wish images are © MGM Studios. All Rights Reserved. In 1974, Charles Bronson (The Great Escape) starred in Death Wish, a film based on the 1972 novel by Brian Garfield. Now, 44 years later, Bruce Willis(Die Hard) has taken up the role of vigilante Paul Kersey in the remake of the film directed by Eli Roth (Hostel) available now on Blu-ray. Paul Kersey is a surgeon in Chicago (in the original novel Kersey was from New York). He finds himself thrown into a state of despair when his wife is killed and daughter put in a coma after a home invasion. After feeling let down by the police investigation, Paul decides to take matters into his own hands. He comes across a gun from a gang member patient that comes into his hospital and learns how to use it. His warpath begins when he notices his stolen watch on the wrist of the gang member, Miguel, and kills him by defibrillating his heart twice. From this point on, Paul is now on a mission. While there is nothing that is wrong with the updated Death Wish film at the same token there is nothing that truly stands out either. With such a compelling story it is a shame this film didn't have the same energy and feel as the novel or the original 1974 film. Action shots are extremely generic and the dialog is bland which really bog down the story. The only shining moment of the film comes in the last five minutes. Where Roth and Willis truly show their skills in crafting a great climactic scene. However, the question remains why didn't they do that for the rest of the film? Aside from Willis, actor Sylvester Stallone (Expendables) was originally slated to star in this film but left due to creative differences. Honestly, I don't think if the actor was changed the movie most likely would have the same look and feel. While Wills ads a certain bravado and charm that another actor would not have pulled off quite as well. It is still such a generic action film any star could have pulled it off. Death Wish was shot digitally and the video transfer shines. The 1080p AVC coding is sharp with clarity and detail. Colors are a bit muted but intended to be this way. It will be interesting to see in the future if/when the studio makes a 4K UHD version how it would look from the digital source material. The lossless DTS-HD MA soundtrack is adequate and serves the film well. Dialog is relegated to the front center speaker, while the special effects are dedicated to the other speakers, and while there is nothing wrong with the audio tracks, at times the special effects are a bit muted. The Blu-ray combo pack includes a DVD copy of the film, a Digital HD copy as well as deleted scenes, a commentary by Eli Roth and Producer Roger Birnbaum, Extended scene of the morning show Mancow, Sway in the Morning, Extended Scene of the radio show scene, a trailer for Grindhouse and Death Wish theatrical trailers, and a featurette entitled, Vengeance and Vision. 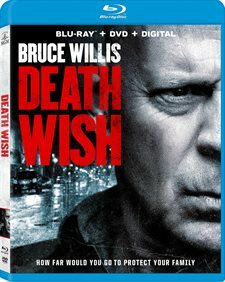 With such great source material, an already built-in audience, and name recognition Death Wish should have been loved by critics and fans alike. However, for whatever reason, the film was just a "paint-by-the-numbers" remake that is unfortunately very forgettable. This movie is the best it remindes me of a lot of thinks In life!